THE Common Market for East and Southern Africa (COMESA) Regional Investment Agency (RIA) and the Swaziland Investment Promotion Authority (SIPA) with the support of BizClim hosted a two-day Regional Validation workshop. The workshop held at the Royal Swazi Sun Libandla Room from Wednesday until yesterday aimed at fostering the development of public-private partnership (PPP) models in the COMESA region. It was attended by participants from the investment promotion and PPP community in COMESA, PPP practitioners from COMESA countries and South Africa, a variety of investors and successful project implementers as well as researchers. A team, which was sponsored by COMESA RIA and BizClim to investigate regional and global good practice in improving the national legal and institutional framework for PPPs, presented its report to the participants. LACK of infrastructure has been identified as one of the key challenges in attracting foreign direct investment (FDI) to the region. Acting Minister of Commerce, Industry and Trade Lindiwe Dlamini noted that Africa still continues to struggle in terms of attracting investment, with only about 3% of global FDI coming to developing economies. "Investment promotion is a key component of the development of our countries. One of the key challenges to investing in the region is the issue of infrastructure," she said yesterday when officially opening a two-day COMESA Regional Validation workshop at the Royal Swazi Sun Libandla Room. 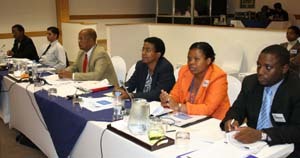 The workshop, organised by the Common Market for East and Southern Africa (COMESA) Regional Investment Agency (RIA) and the Swaziland Investment Promotion Authority (SIPA) with the support of BizClim, aims at fostering the development of public-private partnership (PPP) models in the COMESA region. "As we gather here today, Africa still lacks much needed transport, energy, telecommunications, health, education and other varied forms of infrastructure that will allow us to unlock our potential as a region," said the minister. She noted that most of the mineral resources of the world were concentrated in Africa, but the challenges with regards to energy and transport infrastructure made it difficult for African countries to get more value addition within their economies. She said hence, most of these resources have been leaving as raw ores for value addition elsewhere. Dlamini said challenges with health infrastructure also made Africa a challenging place to do business as investors wondered about issues like being able to get proper medical care for staff. "One cannot over-emphasise the need for more investment into our infrastructure as a region, which is one of the key catalysts to economic activity," she said. "Bringing water to a rural community, for example, can easily change the lives of the people and get them economically active." THE search for lower labour costs, raw material, new markets and more opportunities to diversify has been said to have led to an increasing number of companies to consider investments in developing countries as part of a competitive business strategy. COMESA Assistant Secretary General Stephen Karangizi said more than 25% of all foreign direct investment (FDI) was funneled into developing countries in 2007. He noted that in 2007, Asia and Oceania received US$320 billion in FDI, with China alone getting US$83 billion, while Latin America and the Caribbean received US$126 billion and Africa $52 billion invested predominantly in energy and mining. "The rise in FDI in developing countries reflects the growing trend toward business globalisation and sends a clear signal that government leaders and business executives are finding common ground on which to build new and important relationships," said Karangizi. He said public-private partnerships (PPPs) could help governments build capacity and acquire as well as maintain assets in environments of shrinking or diminished budgets that make public sector investments difficult, if not impossible. He said these also allow private companies to gain new business opportunities, share risks with their public partners and enhance the social and economic environment in which they operate. "Through PPPs, all parties contribute to the creation of a more stable and improved environment that offers benefits to participants and society at large," he said. Karangizi said in sharing and coordinating resources and expertise, the partnership contributes to key development issues by sharing resources and expertise from different sectors and by utilising economies of scale in knowledge generation and dissemination and helps build capacity in developing. "The partnership also supports the development and expansion of sustainable markets and over time, provides access to producer networks or incentives for businesses to invest in non-traditional markets," he added. "In addition, some partnerships can provide small businesses in developing countries with access to consumers in the industrialised world." PUBLIC Private Partnerships (PPPs) can help reduce Africa's infrastructure gap, which is estimated at approximately E320 billion ($40bn) per annum, it has been noted. Delegation of the European Commission Charge d' Affaires Jorge Nieto Rey said PPPs were important as they could provide a service where none was existent before, thus the decision to fund the workshop. "PPPs can provide a service where none was provided before, like referral hospitals, rural telecommunications access and water supply," he said, adding "and the European Union, through the BizClim programme and the COMESA Regional Investment Agency is pleased to fund this important project to promote PPPs across COMESA." He said Africa's infrastructure gap was huge, with the World Bank estimating it at about E320 billion ($40bn) per annum in new investment and maintenance, adding that PPPs could help reduce this gap. He said it was the EU's desire to help COMESA members strengthen their frameworks for PPPs over the coming years. "We hope moreover that this project and this workshop will be the seed of a regional approach to promoting PPPs." Nieto Rey noted that PPPs were not new as they had been used in many parts of the world to provide telecommunication services, toll roads, power plants, hospitals and others. "Many early PPPs succeeded, but many also ran into problems. After a quiet period in the late 90s, they are becoming popular again and across COMESA there is new interest in PPPs," he noted. He noted that across COMESA there have been many PPP projects, but these were mostly ad hoc as there has been little attempt to systematise an approach at the national and regional level. Nieto Rey said even though large scale projects were needed and could be appropriate for PPPs, they could also be difficult to implement. He said experience worldwide shows great potential for smaller projects with greater social impact. "Smaller replicable projects from hospitals to small power plants and municipal markets to sanitation services have vast untapped potential. They are social enterprises which could help poor people," he said. Adding, he said private investors would show increased interest in well-structured projects in countries with good enabling environments, adding that there was appetite among investors and donors for well-structured projects. Nieto Rey said a successful well-structured PPP in one country would get replicated, adding however, that theory could only become reality if the countries commit to learning from each other, sharing and collaborating. 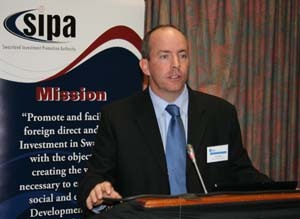 MBABANE – The Swaziland Investment Promotions Authority (SIPA) will today host a regional validation workshop. The workshop is part of a project that is supported by the Africa Caribbean and Pacific (ACP) Business Climate Facility. SIPA Chief Executive Officer (CEO) Phiwayinkhosi Ginindza said the objective of the workshop was to help foster private investment in infrastructure construction and service provision in COMESA countries. “The workshop is based on a regional study that is currently under preparation, to discuss the levels of PPP readiness in the 19 COMESA countries compared to benchmarks including the example of the best practice in African countries. It also serves to disseminate self diagnosis tools directed at IPAS and road maps based on observed best practices,” Ginindza said. He also said the workshop would present standardised PPP contracts that were to be compared with specific provisions relating to the sectors utilities, energy, transport, ports and water supply, as well as a standardised procurement process. The workshop will be held at Libandla Room at the Royal Swazi Spa, starting at 9am. THE Common Market for East and Southern Africa (COMESA) will tomorrow host a two-day regional conference at the Royal Swazi Sun. The conference organised by the COMESA Regional Investment Agency (COMESA RIA) is jointly hosted with the Swaziland Investment Promotion Authority (SIPA), with the support of BizClim. In a press statement released yesterday, the agencies said the conference aims to discuss options and methods to finance infrastructure services in COMESA countries through public-private partnerships (PPPs). Its theme is 'Fostering the Development of PPP Models in the COMESA Region'. It is expected that more than 60 participants from the investment promotion and PPP community in COMESA, PPP practitioners from COMESA countries and South Africa, a variety of investors and successful project implementers as well as researchers will attend the conference. "Many COMESA countries face a crisis of public infrastructure service provision. “Creative use of PPPs in infrastructure can provide a way of increasing service provision through an effective joining of public and private sector capabilities," reads the statement in part. "Such partnerships, both large and small scale, have the power to address many of the economic and social challenges facing poor people." The agencies said a team sponsored by COMESA RIA and BizClim recently investigated regional and global good practice in improving the national legal and institutional framework for PPPs. "They looked at what already exists in COMESA; at the views of central governments as well as line ministries, that is, finance ministries and PPP units; private sector sponsors and advisors; and at how improved arrangements could stimulate more deals in more infrastructure niches," the statement said. It said the team was particularly interested in the importance of a COMESA regional approach to stimulating PPPs in infrastructure, what the advantages of similar arrangements in different countries are, how countries can share relevant experience and the use of PPPs for infrastructure challenges in poorer countries. "The conference will highlight how COMESA countries are beginning to unlock the potential of PPPs in a more systematic way. “It will look at examples that have worked, what investors and sponsors are looking for in the enabling framework and the potential for providing public services through both larger PPP projects and smaller innovative PPP solutions."